Through a strategic partnership with Cooper T. Smith, Enviva Partners, LP leases space at the Port of Mobile in Mobile, AL. Enviva’s pellet manufacturing facilities in nearby Amory , are situated along major inland waterways and highways that make transportation to the Port easy and efficient, reducing emissions and costs. Pellets from the Amory facility are transported along the Tombigbee River and stored in barges until they can be loaded onto an ocean-going vessel. Pellets manufactured at the nearby Wiggins facility are transported by truck. 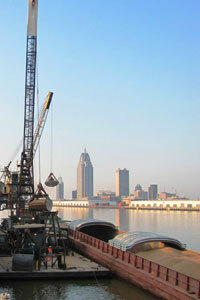 Enviva sends out shipments of pellets every four to six weeks from the Port of Mobile.